blog.HalloweenAdventure.com | Latest News from the Costumes Trend FrontLines! : Part of your world: Little Mermaid Costumes! Part of your world: Little Mermaid Costumes! One of the most beloved Disney princesses in the world, Ariel’s sweet voice and adorable demeanor won the hearts of merpeople and mortals alike. Now there are various sequels and prequels to the Disney film, and there’s even a show on Broadway! What better time than this Halloween to dress up like your favorite underwater characters? 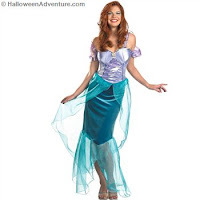 Start with the girl everyone loves with our Ariel Deluxe Adult Costume. Costume comes with a bodice, skirt/fin and attached cameo. 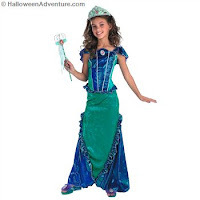 Try a mother and daughter duo costume with our Ariel Deluxe Child Costume. Kid’s costume is a top quality ensemble that includes a full-length Green velvet dress with iridescent detail. Mimic Ariel’s long red hair with our Silver Screen Sensation Wig or our Sultry Deluxe Wig in Natural Red. 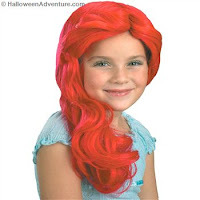 Girls can try our Ariel Wig, which features bright red hair that matches Disney Ariel’s perfectly!